When the Twins were first born, a family friend who is a mother of three now-grown children once told me, “Now that you’re a parent of two, people are going to offer you help. A word of advice: let them.” Of course, the context for this was her generosity and my insisting it wasn’t necessary, but a lot has happened since then, and roughly a year later, I’m so on board. I don’t even glance at the mouths of gift horses. Don’t tempt me, Mister Ed. Thus, when my parents offered to take the Twins, my wife and me to Maui with them on vacation, I blurted “We accept!” and scrambled my wife and kids out to the car, gunning it down the road before my parents could change their minds or say they were joking. But as it turns out, the offer was genuine. See, over the years, Maui has become a regular pilgrimage for my family. My parents are proud timeshare owners and visit at least once a year. (They even let my wife and me enjoy these accommodations on our honeymoon four years ago.) The bottom line was that my mother and father wanted to spend a week in their favorite place with their grandbabies, and luckily, were okay with my wife and me tagging along. Of course, taking this trip would also mean bookending it with the Twins’ first and second airplane rides ever, and although I received expert advice in preparation for this endeavor, it was still considerably intimidating. After all, I am well aware of my children’s squirming proficiencies and potential volume levels. However, despite this crippling adversity we made it to paradise and back with much less of a struggle than we anticipated. That’s right. We’re already back. I’d intended to write about this rip-roaring adventure sooner, but after a week of grueling end-of-semester deadlines and the mounting monotony of not having an actual vacation since years before the Twins were born, I just didn’t have it in me. I needed a break–from school, from writing, from social media, from thinking in general. I needed to do nothing. I did not get this per se, as I still had to parent 15-month-old twins, but it was closer than usual, and the sound of crashing clear-blue waves, the über-refreshing, cool island breeze, and multiple rounds of stiffly-poured mai tais certainly helped. Taken with my crappy digital camera. It actually looks like this. Having sufficiently beach-slapped myself, I hoped to return to Phoenix with life in perspective–recharged and ready to take on the world again–but it seems I overcompensated on the relaxation. Even with the constant activity of uphill stroller plods and keeping waves from knocking the Twins over, I gained five pounds (I blame the obscenely delicious freshly caught fish and aforementioned mai tais), and instead of rebooting my motivation, it’s taken days to get my head back in the game. 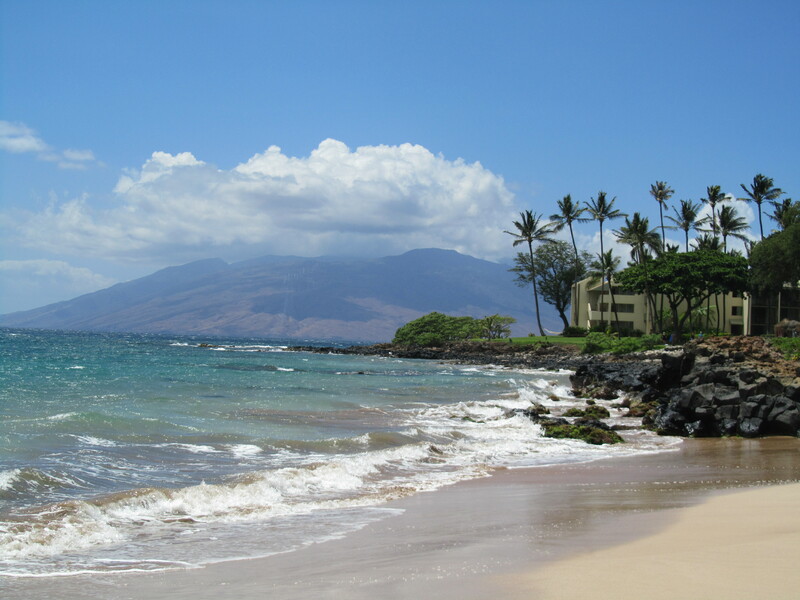 By the end of most vacations, I’m ready to leave, but whenever I’m dragged kicking and screaming away from Maui, I oscillate between lazy, daydreamy “I’m-still-on-vacation” denial and elaborate nonsensical schemes to move there permanently. I could be a surf instructor. I don’t know how to surf, but neither will the people I’m teaching. Perhaps I could dust off my guitar and play campy island-themed standards while sunburned tourists eat overpriced burgers. Or maybe I could be the “Mahalo” Guy. (For those who have never been to Hawaii, every establishment seems to have a person stationed at the exit to say “Mahalo”–Hawaiian for “thank you”–as people leave.) I could really see myself mahalo-ing the ma-hell out of that, and would even be mindful of women who were not Mahalo-back Girls. Anyway, if it pleases the court, now that I’ve finally changed out of my board shorts and returned to coherent thought formation, I hereby present TwinfaMaui, a ridiculously-named special edition series of upcoming Twincidents in which I’ll share some of my favorite Maui moments. This is Part 1 of the highly unanticipated TwinfaMaui Saga. You can read every thrilling installment of this seminal masterpiece here. If not, drink three mai tais and try again. Yes, they are the Mahallest. I already can’t wait to go back, which looks like it won’t be for another few years. Was stationed at Ft. Shafter on the island of Oahu, so I can vouch for the beauty of the islands that comes through even with a “crappy digital camera”. Amazing, I never missed Hawaii till reading this… It’s been several years, so maybe I’ve finally put enough time & space between me & the yucky times to think of visiting Waikiki for a vacation! Thanks! Sorry to hear you had a bummer of a time–I hate when memories can taint things like vacation spots or songs and whatnot. Hard to get past it, but I think it’s worth it, especially for Hawaii’s sake. Maybe try a different island, so you’re not returning to “the scene of the crime”? Mahalo-back girl! Hilarious! That sounds like a pretty sweet job. When I was in Jamaica there was an old dude and his job was playing guitar at the taco stand. NICE! Thanks, man. Seriously, though. Think about it. How amazing would it be to sit and play guitar all day on the Hawaiian shore…FOR A JOB? Reminds me of home. . .oh how I miss it! Are you from Hawaii? If so, do you have any connections that could get me that Mahalo Guy gig? Welcome back. I get that way even when I’m not on vacation. Its not so much that I have nothing to say (that rarely happens) its just I hit a wall where I’m exhausted. Between all the daily routines, sometimes I just need a break. Thanks, Jimmy. Yeah, I hear you. I don’t really get “writer’s block.” I’m surrounded by ideas and it’s just a matter of finding time to actually get them down, but sometimes when I finally do have the time, I’m just too burnt out. I honestly think I could fake the first few surf lessons pretty well. As a teacher, I’ve become proficient at pretending to know what I’m talking about. I have got to get there. Like soon! I can’t wait to hear about the twins’ adventures! You’ll never want to leave. It’s spectacular. Thanks! I’m mahalooking forward to the mahalowdown on the trip. And glad the advice got you there and back without a lawsuit. Mahalo for your support, Sir Rootstock, although the mention of lawsuits is puzzling to me. I can’t imagine how any of your advice could lead to legal action, as spot-on as it is. I guess some people just don’t know great parenting when they see it. look. there’s “family trip” and there’s “vacation.” Family trip frequently requires more of a recovery period than vacation, although when one vacations in a world that looks as if it’s been photoshopped (those clouds! that wave! those palms! ), a recovery period is medically necessary and may include slack-jawed dreaming in public places that are loud and full of cement, like grocery store parking lots or highways. Doesn’t that time-share resort need caretakers? Just a thought. I’ve volunteered several times as a caretaker, but to mixed reviews. One day, I’ll be heard. There has definitely been a fair share of day-dreaming amidst concrete nonsense. But I guess that makes it a great place to go back to in a few years instead of taking it for granted. I’m sure there are at least some unhappy people living there and for some reason, that’s funny to me.